Television schedules are no strangers to stories of war. From BBC1’s The Crimson Field, which was produced to coincide with the 100th anniversary of the start of the First World War last year, to RTL’s Cold War spy thriller Deutschland 83, conflicts continue to provide scriptwriters with a host of compelling stories. 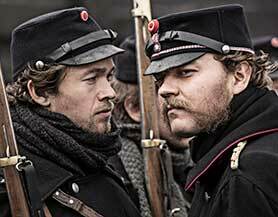 Fresh from producing historical epic 1864, which is set against the backdrop of one of Europe’s bloodiest ever battles, Denmark’s Miso Film is now turning its attention to a drama that will examine issues that are new to the country. The prodco has partnered with writer/director Christoffer Boe for six-part series Warrior (fka Prospect), which is based on an idea from Boe and is being developed with Simon Pasternak. It tells the story of a former soldier who struggles to find his way back into society after returning home from war. When he learns that a friend and fellow former soldier has committed suicide, he sets out to learn the truth behind his death. Miso Film co-founder Jonas Allen says Warrior confronts a topic that is still very new for people in Denmark. He explains: “Christoffer is a very talented director so we wanted to work with him – but we really liked the story. It’s about a soldier coming back from war in Afghanistan. This is new in Denmark – having veterans coming back, having people in service and Denmark stepping into a war in present times. Warrior is set to go into production in spring 2016, and will air on TV2 in Denmark. Meanwhile, 1864 was recently nominated for Best Drama at the Golden Nymph Awards, which took place earlier this month at the Monte Carlo TV Festival (though the prize was won by UK/US copro The Missing). The show’s stars Jens Setter-Lassen and Sarah-Sofie Boussnina were also nominated, for Best Actor and Best Actress respectively. The eight-part series tells the story of two brothers who sign up for the army when war breaks out between Denmark and Prussia, and follows the love triangle they become embroiled in during a brutal conflict. Allen says: “1864 aired last fall on DR. We were very pleased – we had one of the greatest openings. I think it was about 1.8 million viewers or 67% audience share. Our average was 1.4 million viewers, which was great. Miso Film is also preparing to begin shooting the third season of its TV2 crime drama Dicte, which is based on Elsebeth Egholm’s novels. Production will get underway in September.